× 2 = 6 Required Please enter the correct value. The Fitbit IPO will be priced after market close tomorrow (Wednesday), and the company has set a price range of $17 to $19. The Fitbit (NYSE: FIT) share price will soar from there if it follows the typical first-day pattern – but it will have trouble maintaining any initial momentum. The IPO is one of the most talked-about tech deals of 2015. Fitbit – which makes wearable activity trackers that measure calories burned and number of steps walked – plans to raise $621 million by selling 29.85 million shares. You see, Fitbit is the most dominant player in the fitness-related wearable tech market. 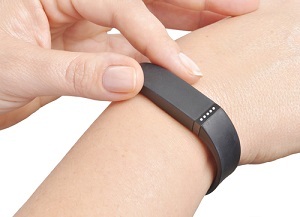 Fitbit's products constituted 85% of U.S. wearable fitness devices in the first quarter. Revenue grew a massive 209% to $337 million over that same three-month period. The company went from losses of $4.3 million in 2011 to profits of $131.8 million in 2014. Apple Inc. (Nasdaq: AAPL) and the Apple Watch will influence where the Fitbit share price goes after its June 18 debut. The overwhelmingly popular Apple Watch has fitness and exercise tracking capabilities, making it Fitbit's toughest competitor. According to a Fortune survey, 2015 sales estimates for the watch range from 8 million to 41 million units. The survey's average of 22.6 million beats Fitbit's total sales of 20.8 million by 8.7%. Fitbit noted in the "Risk Factors" section of its IPO filing how it faces stiff competition from the tech giant's newest product. "We expect competition in our market to intensify in the future as new and existing competitors introduce new or enhanced products and services that are potentially more competitive than our products and services," the filing stated. Wearable tech is expected to become a $19 billion market by 2018, and there may be enough room for both Fitbit and competitors like the Apple Watch. But since wearable tech is still in its infancy, it's hard to tell who will survive down the road. So you are clearly an apple supporter. "overwhelming apple watch". Sorry had to stop reading when I got there. Where is all the people with them? The sales have been low compared to what they should be. All the issues apple had and took stuff off to just get the watch on the market.